<b>Classics for Your Collection:</b> <br /> <br /> <b><b>goo.gl/U80LCr</b></b> <br /> <br /> --------- <br /> <br /> Ebenezer Scrooge, the very definition of grumpy miserliness, gets a second chance at figuring out what's really important in life, with the help of some ghosts who give him an unforgettable version of &quot;This is Your Life.&quot; <br /> <br /> In the book's famous opening scene, on the night just before Christmas the old miser Ebenezer Scrooge sits in his freezing cold counting house, oblivious to the discomfort of his shivering young assistant Bob Cratchit. Scrooge is ceaselessly rude to relatives and visitors alike who drop in to convey their Christmas greetings or ask for a contribution to charity. <br /> <br /> Scrooge returns to his equally chilly mansion where he has an extraordinary supernatural experience. The spirit of his dead partner, Marley appears narrating tales of eternal suffering that he is condemned to endure because of the mean and uncharitable deeds that Marley did when he was alive. <br /> <br /> Marley tells Scrooge that three other supernatural visitors will make their appearance over the next three nights. The rest of the book traces the events that happen when these three otherworldly beings visit Scrooge. <br /> <br /> Charles Dickens' <i>A Christmas Carol</i> is a quintessential piece of what Christmas is all about (and maybe a touch Halloween, too!). The story succeeds in entrancing so many of us because it touches upon the emotions, the senses, the human condition, and encapsulates it all in the life and death struggle we all go through...plus, who doesn't love a good ghost story and a happy ending!? <br /> <br /> A pearl in your book shelf. <br /> <br /> Scroll Up and Get Your Copy! 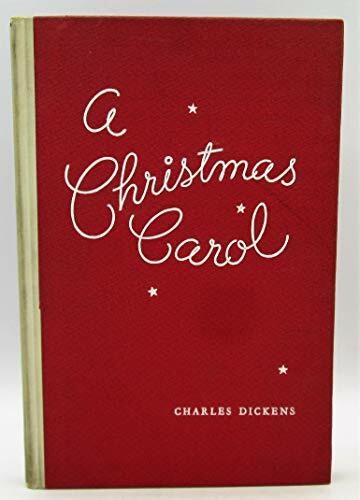 In the history of English literature, Charles Dickens's <i>A Christmas Carol</i>, which has been continuously in print since it was first published in the winter of 1843, stands out as the quintessential Christmas story. What makes this charming edition of Dickens's immortal tale so special is the collection of 80 vivid illustrations by Everett Shinn (1876-1953). Shinn, a well-known artist in his time, was a popular illustrator of newspapers and magazines whose work displayed a remarkable affinity for the stories of Charles Dickens, evoking the bustling street life of the mid-1800s. Printed on heavy, cream-colored paper stock, the edges of the pages have been left rough, simulating the way in which the story might have appeared in Dickens's own time. Though countless editions of this classic have been published over the years, this one stands out as particularly beautiful, nostalgic, and evocative of the spirit of Christmas.